This salad is typical of fondas . Whenever someone goes to a Mexican fonda is highly probable that this salad will be seen served on the table, ready to be enjoyed. 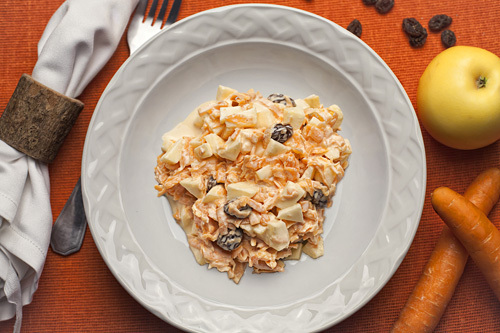 The carrot salad with cream is simple since it only has grated carrot, raisins and diced apple. But the cream that is prepared to season the salad is fantastic . It really gives another dimension to the whole dish – you have to taste it. This salad can be served as appetizer or accompanying a main course of your choice, specially if it is a dish with pork. This salad is very easy to prepare. You only have to peel, grate and mix ingredients. A very good recipe for beginners. The recipe is prepared with mayonnaise and you can use the type of mayonnaise that you like the most. In the salad apple is used and we recommend the red apple because it gives a sweeter flavor to all the salad. Total preparation time 15 minutes . The recipe serves 4 portions. It is always better to enjoy the carrot without its skin. Grate the carrots that were peeled and reserve. Dice 1 apple, then reserve. 1/4 cup of Mexican Cream. Mix very well the bowl ingredients with a mixing spatula, until they are well incorporated. The Carrots that were grated. The Apple dices that were cut. Mix very well the carrot salad with cream with the mixing spatula. Put in the fridge the carrot salad with cream and leave it resting for 10 minutes, so the flavors mix and settle. Tip: If you want to give a special touch to the salad put 1/2 cup of minced nuts. Recommendation: This salad can also be served over a lettuce bed. Did you like the Salad?